Apple has sent out a memo to its international Apple Retail Employees, asking for innovative ideas on how to improve the iPhone, the retail store environment, and company sales techniques. According to 9to5Mac, the message was distributed late last week. 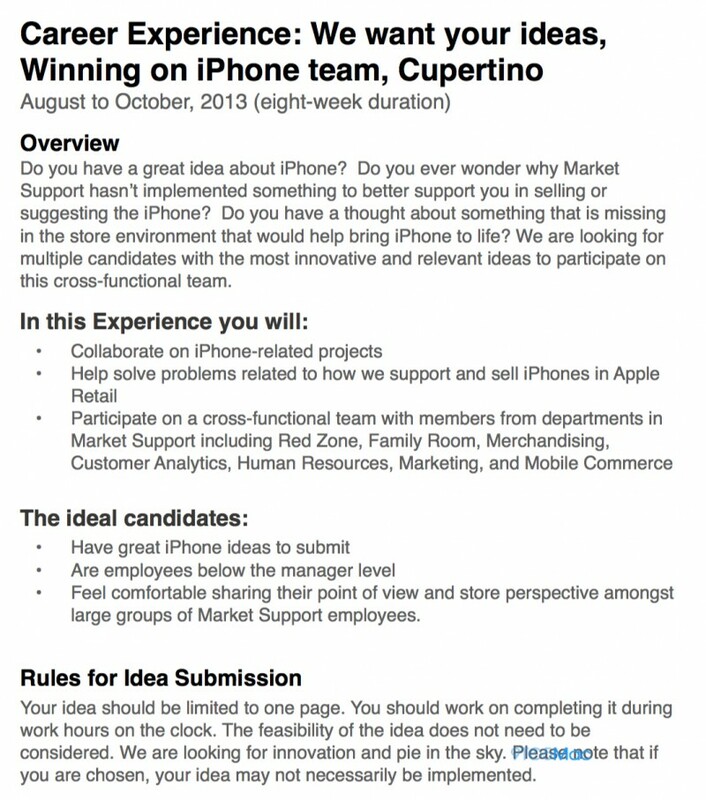 Employees are asked to submit an idea, which will lead to an eight-week experience where selected candidates will interact with members from various Apple departments at the company's Cupertino headquarters, including Marketing, Merchandising, Customer Analytics, Mobile Commerce, and more, in order to "solve problems" related to the way Apple sells and supports its iPhones. Apple occasionally turns to its Apple retail employees for assistance with various aspects of software development. In late 2012 Apple asked its workers to help improve the Maps app and a number of current employees have been given access to the OS X Mavericks beta for testing purposes. Earlier this month, several Apple executives including Tim Cook spoke with Apple Retail Store leaders about upcoming iPhone incentive programs and discount strategies aimed at selling more iPhones in-house. What's wrong with asking the people that sell your product on a daily basis, how they can better improve this product and the selling process? The smartest man is a man who knows when to ask for help. Asking for info from the idiots that work in Apple Stores? I don't see this as bad thing. Soliciting ideas from more sources like employees makes sense. The more avenues/broader spectrum of ideas coming in can only help. I know a lot of businesses are pushing similar practices such as this - encourage employees to contribute ideas and in some small way shape policy. I don't think think it reflects poorly or that management has "run out of ideas." edit: I do agree the Apple store employees aren't always the brightest minds, still can't hurt to get feedback from them however. They aren't doing this because they have trouble selling iPhones in general. They're doing this because majority of iPhones are sold by Carrier Stores instead Apple stores. That in itself isn't a failing on Apple's part but rather general consumer associations; "if you want to buy a Mac go to an Apple store, if you want to buy an iPhone go to your local Carrier Store". Way better than soliciting it from proven 'idiots' such as these posting in forum comments sections. Every time I see "airplane mode" and "driving mode" on the same screen, I look for "boating mode"